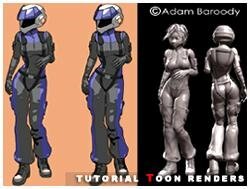 Photoshop Tutorial : TooN Renders !! Photoshop / 3D Tutorial : Toon Renders, How too.......?? - This is a very easy to learn and handy Photoshop Rendering Tutorial Written by Adam Baroody. Adam Baroody explains How-to use Photoshop to Ink your Toon Renderings. Adam; This is a pretty simple and yet very effective way to ink your cell shaded renders. I found this technique to be very fast and the quality of the inking at times will out do the inking in your standard ink and paint shaders.There are drawbacks to this method and i will illustrate them later on in this tutorial but for now lets look at how its accomplished. In order for this technique to work, we need to render in layers. I use Softimage XSI these days and find it to be one hell of a 3d program that simply excells at animation and rendering. Personally i prefer XSI's Toon shader to this method but this method does at times give a slightly better look but more on that later. This technique can be used in any software package that has an incidence shader (fall off shader in 3dsmax terms) It also helps that you have a cell shader such as ink and paint in.................Link ! !